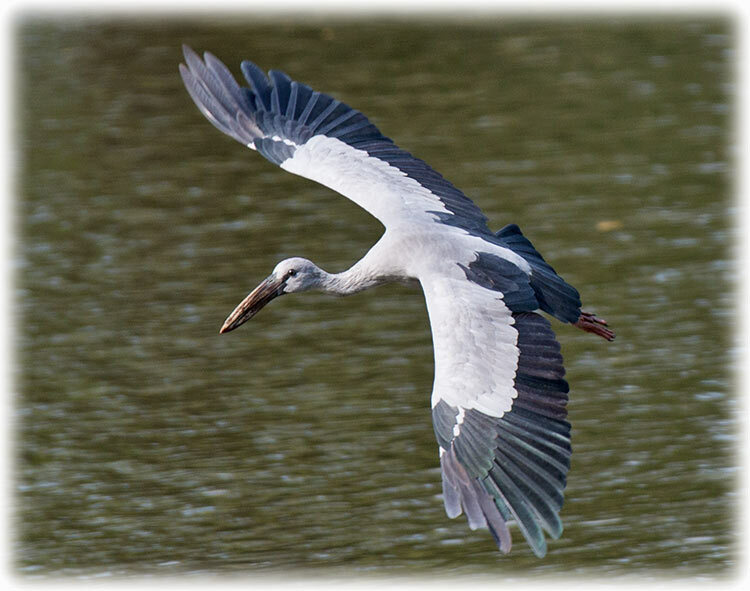 The usual foraging habitats are inland wetlands and are only rarely seen along river banks and tidal flats. 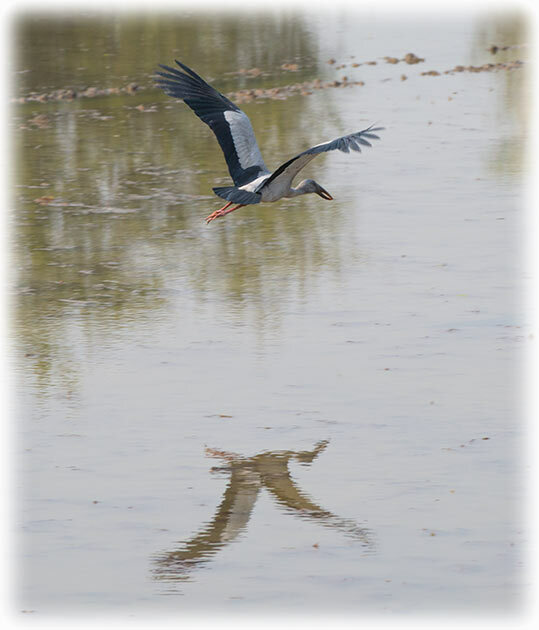 On agricultural landscapes, birds forage in crop fields, irrigation canals, and in seasonal marshes. 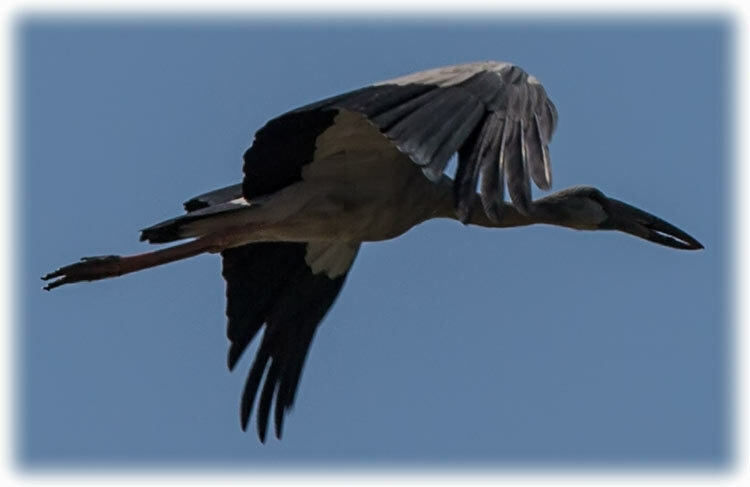 Birds may move widely in response to habitat conditions. 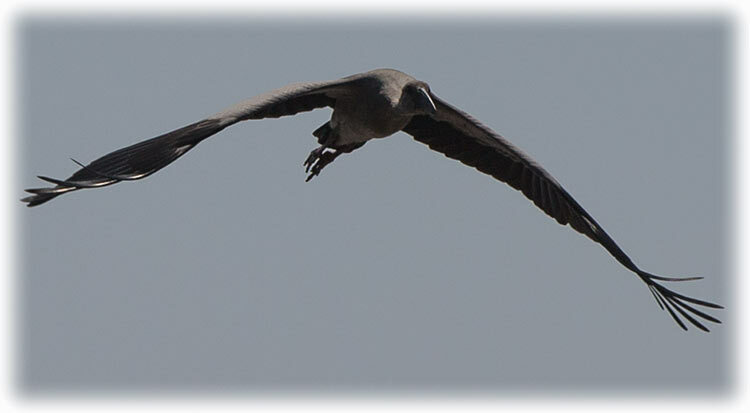 Young birds also disperse widely after fledging. 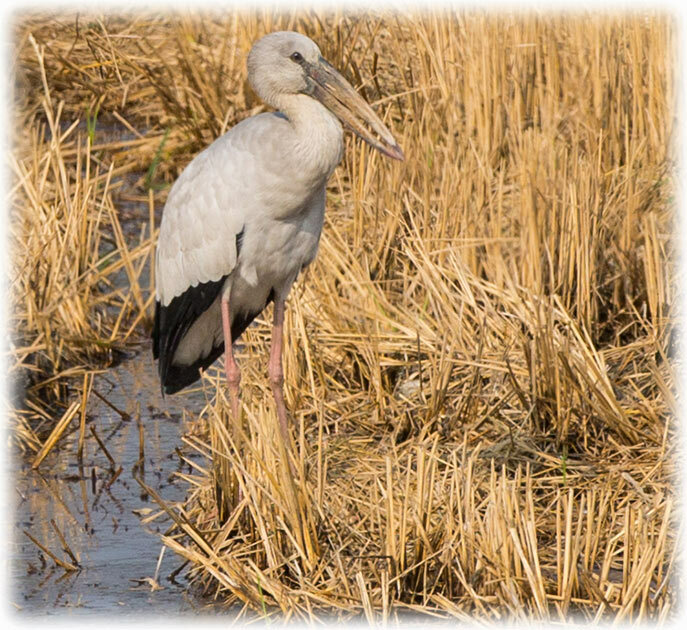 Individuals ringed at Bharatpur in India have been recovered 800 km east and a bird ringed in Thailand has been recovered 1500 km west in Bangladesh. 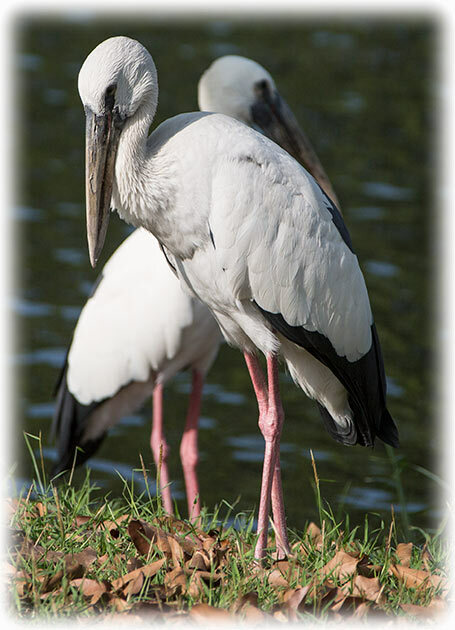 Storks are regularly disoriented by lighthouses along the southeast coast of India on overcast nights between August and September. 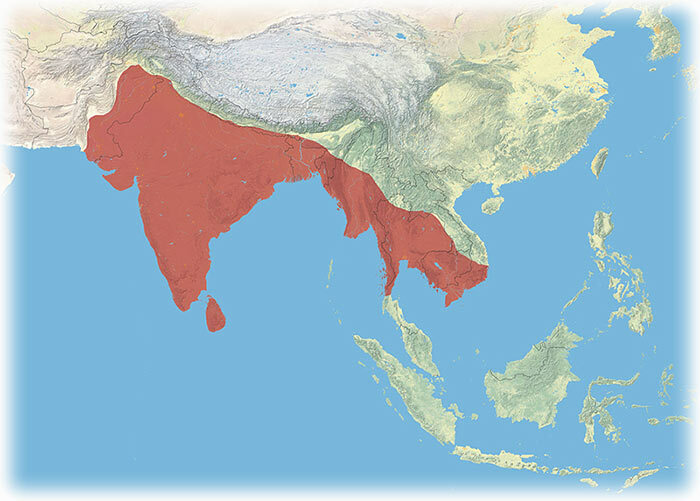 The species is very rare in the Sind and Punjab regions of Pakistan, but widespread and common in India, Sri Lanka, Burma and Thailand. 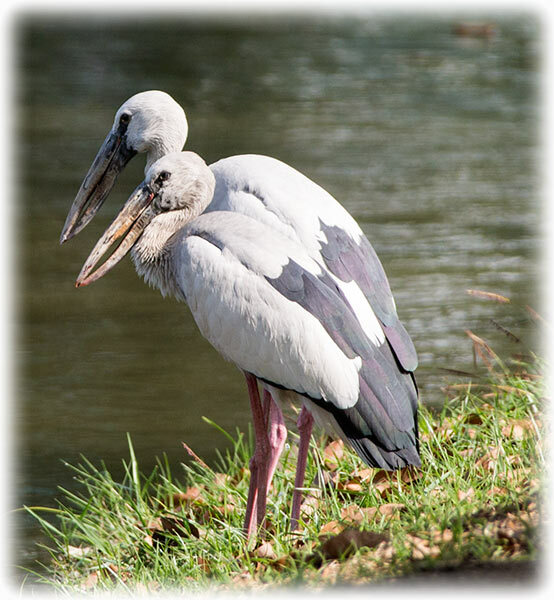 The Asian openbill stork is predominantly greyish (non-breeding season) or white (breeding season) with glossy black wings and tail that have a green or purple sheen. The name is derived from the distinctive gap formed between the recurved lower and arched upper mandible of the beak in adult birds. Young birds do not have this gap. The cutting edges of the mandible have a fine brush like structure that is thought to give them better grip on the shells of snails. The tail consists of twelve feathers and the preen gland has a tuft. The mantle is black and the bill is horn-grey. 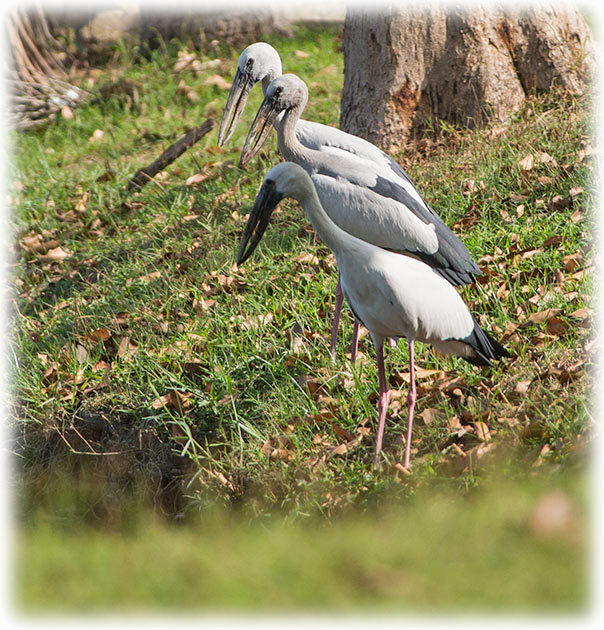 At a distance, they can appear somewhat like a white stork or Oriental stork. The short legs are pinkish to grey, reddish prior to breeding. Non-breeding birds have a smoky grey wings and back instead of white. Young birds are brownish-grey and have a brownish mantle. 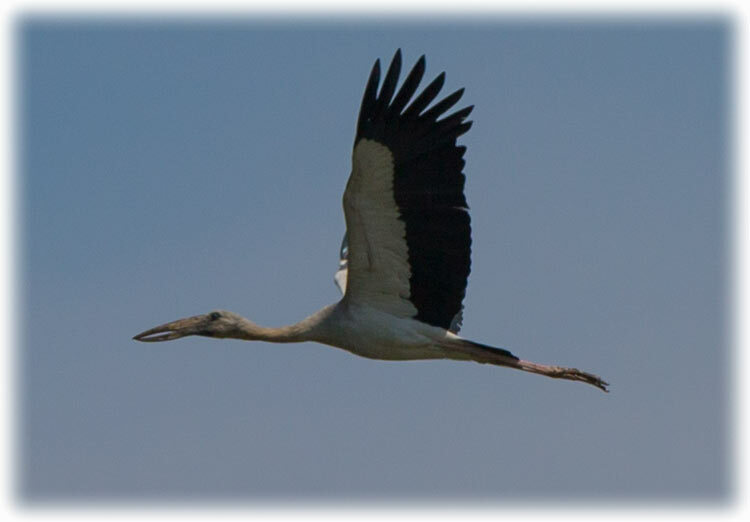 Loud calls of pulli in the nests of a breeding colony. 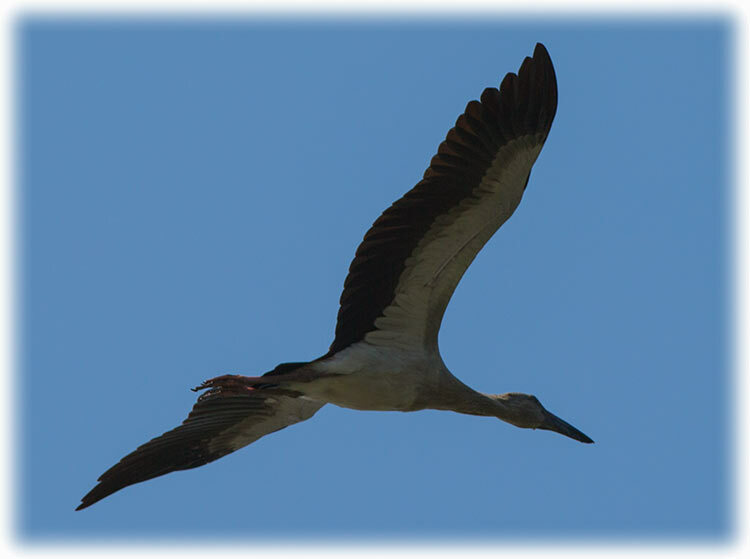 During the warmer part of the day, Asian Openbills soar on thermals and have a habit of descending rapidly into their feeding areas. Groups may forage together in close proximity in shallow water or marshy ground on which they may walk with a slow and steady gait. 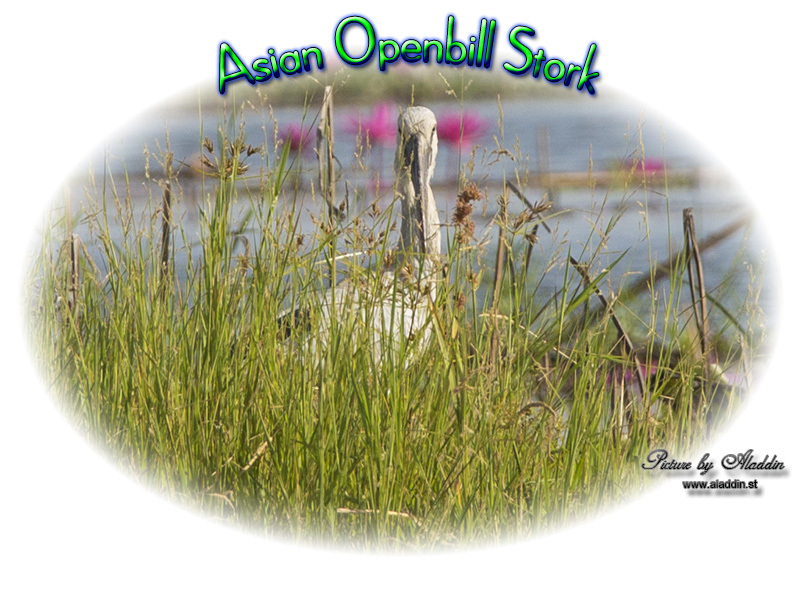 The Asian openbill feeds mainly on large molluscs, especially Pila species, and they separate the shell from the body of the snail using the tip of the beak. The tip of the lower mandible of the beak is often twisted to the right. This tip is inserted into the opening of the snail and the body is extracted with the bill still under water. Jerdon noted that they were able to capture snails even when blindfolded. 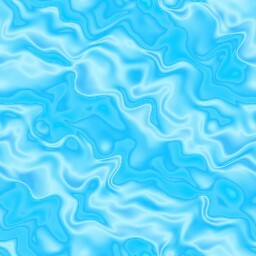 The exact action being difficult to see, led to considerable speculation on the method used. Sir Julian Huxley examined the evidence from specimens and literature and came to the conclusion that the bill gap was used like a nutcracker. He held the rough edges of the bill as being the result of wear and tear from such actions. Subsequent studies have dismissed this idea and the rough edge of the bill has been suggested as being an adaptation to help handle hard and slippery shells. 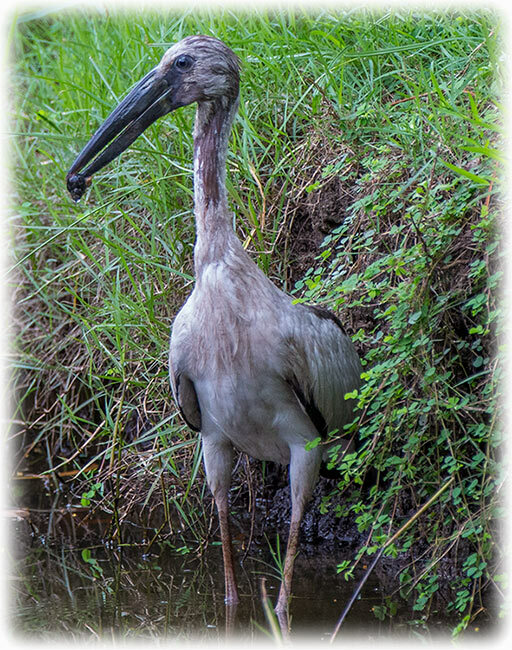 They forage for prey by holding their bill tips slightly apart and make rapid vertical jabs in shallow water often with the head and neck partially submerged. The gap in the bill is not used for handling snail shells and forms only with age. Young birds that lack a gap are still able to forage on snails. It has been suggested that the gap allows the tips to strike at a greater angle to increases the force that the tips can apply on snail shells. Smaller snails are often swallowed whole or crushed. 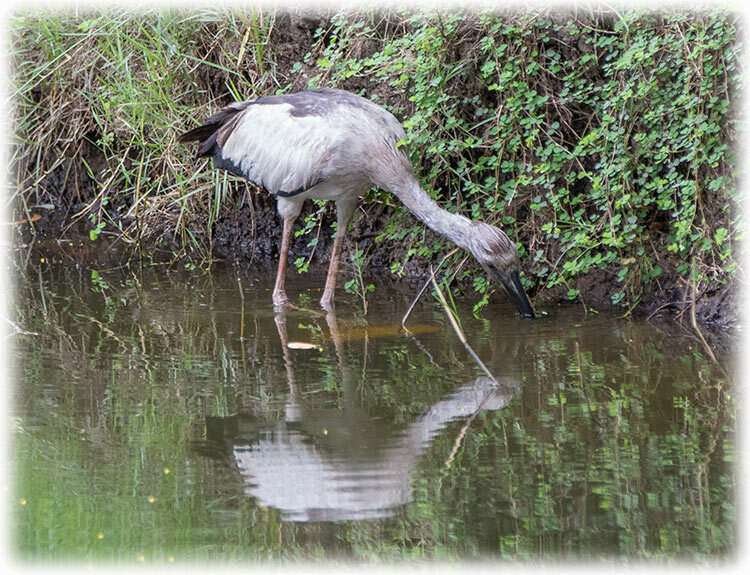 They also feed on water snakes, frogs and large insects. 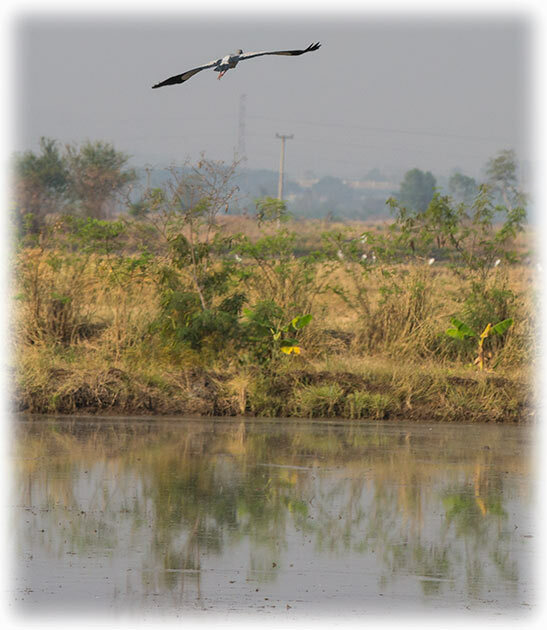 When foraging on agricultural landscapes with a variety of habitats, Asian Openbills preferially use natural marshes and lakes (especially in the monsoon and winter), and irrigation canals (especially in the summer) as foraging habitat. 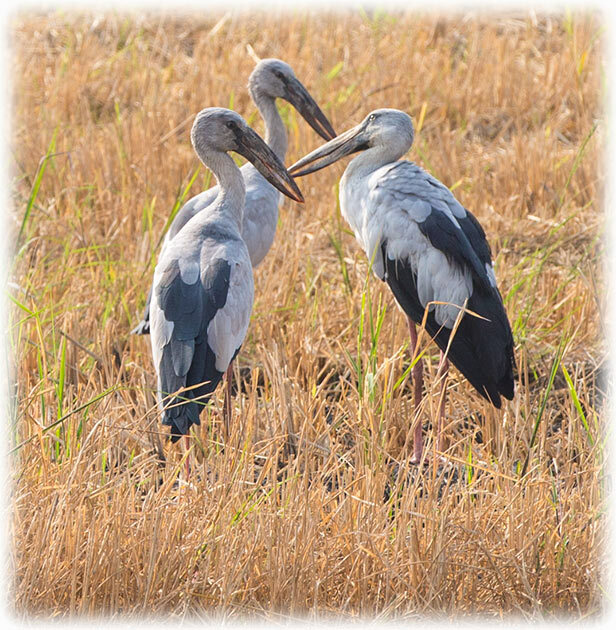 The breeding season is after the rains, during July to September in northern India and Nepal, and November to March in southern India and Sri Lanka. 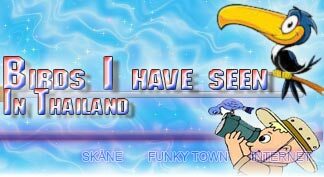 They may skip breeding in drought years. 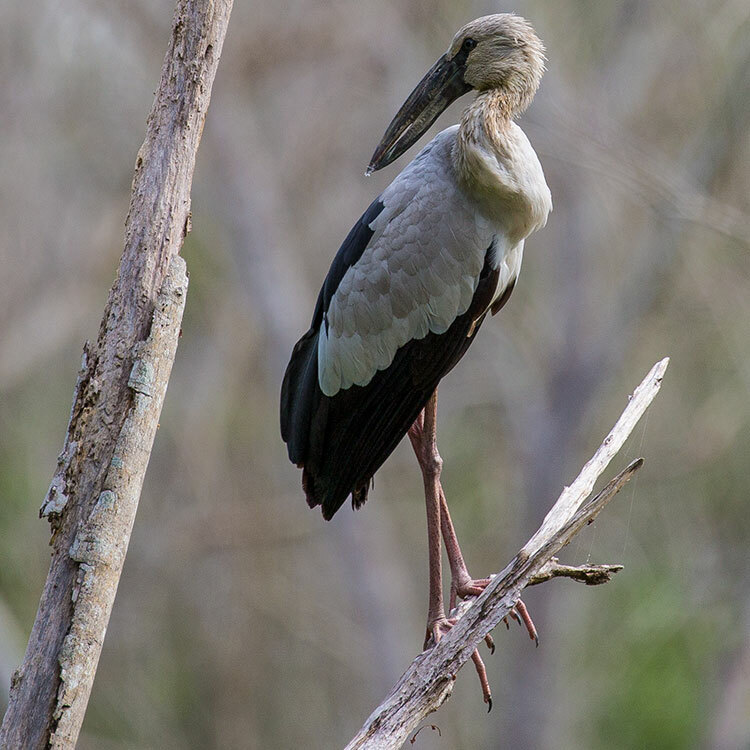 The Asian openbill breeds colonially, building a rough platform of sticks often on half-submerged trees (often Barringtonia, Avicennia and Acacia species), typically laying two to four eggs. The nesting trees are either shared with those of egrets, cormorants and darters, or can be single-species colonies like in lowland Nepal. 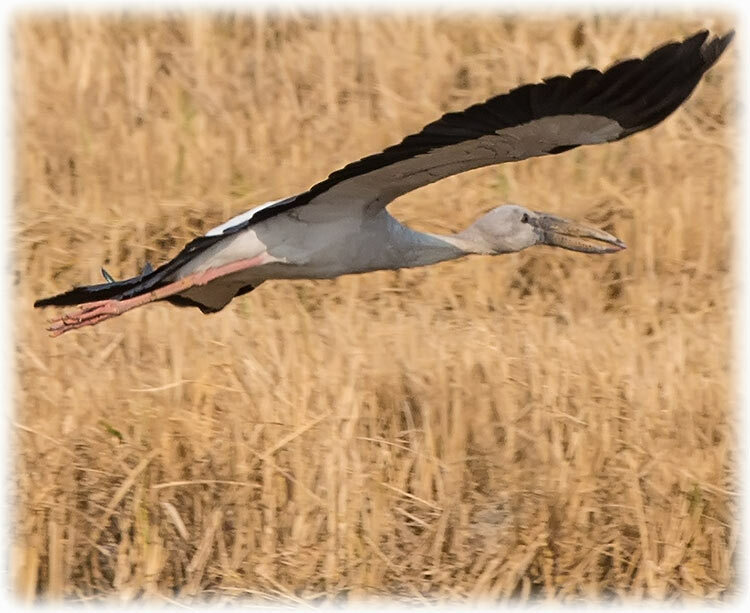 Nesting colonies are sometimes in highly disturbed areas such as inside villages and on trees located in crop fields. In lowland Nepal, 13 colonies found in an agricultural lansdscape had an average colony size of 52, ranging from 5 nests to 130 nests. The nests are close to each other leading to considerable jostling among neighbours. Both parents take turns in incubation, the eggs hatching after about 25 days. The chicks emerge with cream coloured down and are shaded by the loosely outspread and drooped wings of a parent. 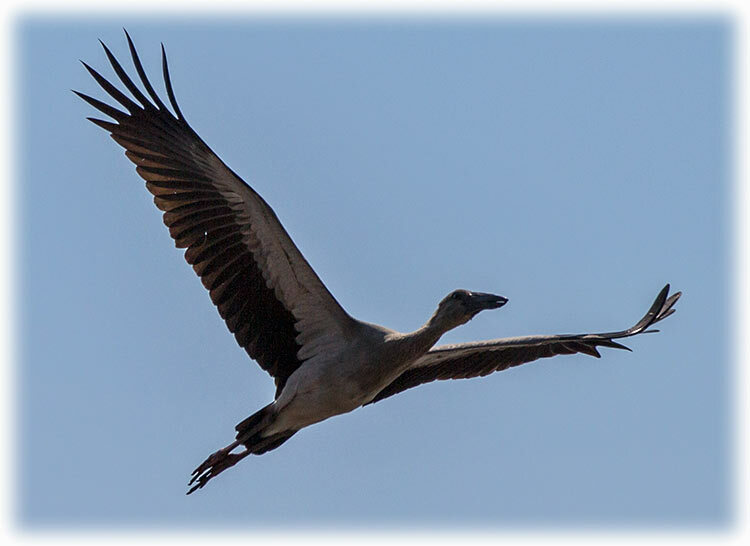 Adult Asian Openbills in Nepal took an average of 27 minutes to return to nests with food for nestlings and fledglings. 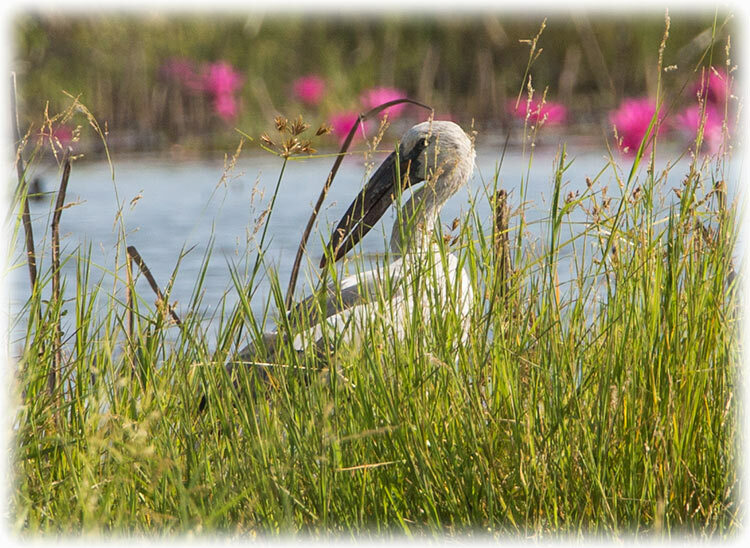 The time taken to find food was most impacted by the location of wetlands around colonies, and the progression of the breeding season. Adults look the least time to return with food earlier in the season when the dominant rice crop was most flooded, and time increased as the rice ripened along with the drying out of the fields.